1. It contains magnesium. Magnesium is another important component of our diet, yet only 32% of people consume enough magnesium. If your body is running low on magnesium, that could cause low energy levels or even lead to serious health conditions like asthma, diabetes and osteoporosis. A serving of coconut water take care of about 14% of your daily magnesium needs. 2. It contains copper. Copper is another essential mineral for your health. Without copper, your organs and your metabolism simply can't work like a well-oiled machine. One serving of coconut water will provide about 11% of your daily copper requirements. 3. It contains cytokinins. Cytokinins are little-known, yet highly beneficial compounds found in coconut water. Science has confirmed cytokinins slow down the development of cancerous cells, plus they slow down the aging process. What's not to love, right? 4. It contains antioxidants. 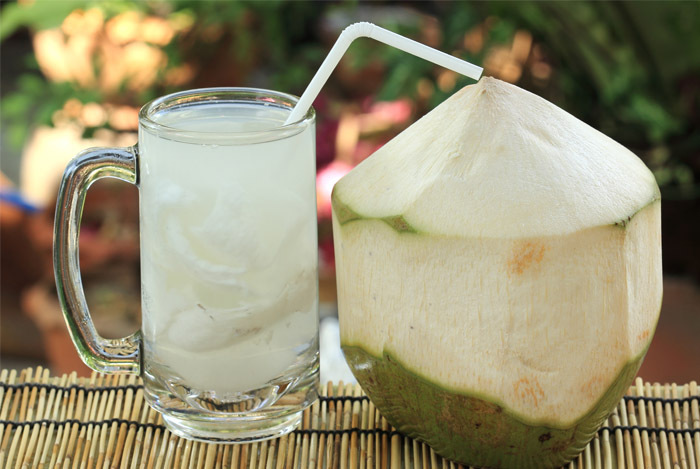 Coconut water contains a lot of antioxidants, which help prevent the damage to our bodies caused by free radicals. Free radicals are produced by your own metabolism, so there's no other way to neutralize the damage, except making sure you consume enough antioxidants in your diet. And coconut water can help you with that. 5. Coconut water is mostly just ... water. I'm sure you already know you need to drink enough fluids so you can keep your body healthy and properly hydrated. Just like its name suggests, coconut water contains about 95% water. This makes it a great hydration drink. Coconut water can hydrate your body just as well as plain water (the mother of all hydrating drinks). 6. It's low in calories. Unlike plain water, coconut water is not entirely calorie-free, but at 42 calories per serving (240g) it's still a pretty low-calorie drink. This makes it an awesome replacement for any one of your regular, sugar-sweetened drinks and when used like this, coconut water can help you reach your weight loss goals. 7. It contains potassium. Potassium is a vital mineral in your body. You need enough of it if you want your brain and nervous system to function properly. Coconut water can help provide some of that much needed potassium. One serving of coconut water will cover about 13% of your daily potassium needs.